19 | November | 2014 | SHANNARO!!! One Piece Manga Chapter 768: The D.
Hey guys, WS here for this week’s chapter review. The flashback ends, for now at least. 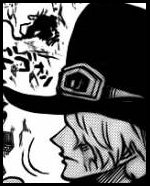 I expect to see a little more of Law’s past later, like how he met his crew and how he came to be a Shishibukai. We get to learn a bit more about the D this chapter. There used to be a group of people called the family of D. which is the natural enemy of god. So everyone we know with the D is probably a descendant of that family. This explains why the government wants pretty much everyone with that name dead and why there’s hardly anyone with the name of D in the government / marine while we’ve seen plenty of Pirates with the D.
Doflamingo and Law fight for most of the chapter. As Law mentions the name of D, Doflamingo thinks Luffy’s out to kill him, but Law reveals he’s part of D himself. Doflamingo rants on that he isn’t afraid of the D and that it doesn’t matter to him who comes for his head. But he seems to get more angry and reckless as he gets in range of Law’s ability who ofcourse doesn’t waste this opportunity to deal some damage. The other half of the chapter is all over the place, we get to see who’s where and what they’re doing. Nothing has changed since we first saw them. But it’s a nice way to recap and summarize everything that’s happened up till now. Well that’s it for this week, tell me what you think.